The man who was stabbed at the West Ham versus Millwall Carling Cup match was attacked after becoming separated from his sons as rival fans chased them. The 43-year-old Millwall supporter, who is in a stable condition, was targeted by West Ham fans after arriving at the wrong gate at Upton Park, east London. Police said: "The victim was subjected to a brutal and sustained attack as he and his family tried to flee." 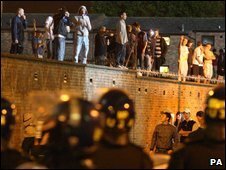 Fourteen people were arrested as fights raged around the ground for hours. A police spokesman said the stabbing victim was one of 10 family members who had gone to watch the game. As the group tried to reach the correct part of the ground they were approached by a gang of West Ham supporters who followed them along Tudor Road. It was then that the victim and his sons, aged 17 and 18, were separated from the rest of the family and attacked by the gang who punched and kicked them. "The victim was further separated from his sons and continued to be attacked by the group, receiving a single stab wound to the chest," the spokesman said. The man was found collapsed near the Priory Road bus garage by his sons. Det Insp Lee Barnard, from the Newham violent crime unit, said: "This incident was not a pre-arranged act of violence between two sets of rival supporters; this was an innocent family man who was subjected to a senseless attack by people intent on causing violence. "If not for the swift intervention of paramedics, the man would have lost his life." About 200 riot police and at least 20 mounted officers were deployed to contain violence between the fans. Nine people have been charged over incidents related to the game. Charges cover offences such as breaching a football banning order, assaulting a police officer and other public order offences. The events brought widespread condemnation from football bosses and politicians.